Let’s see what’s happening so far. EUR most bid currency that session +1.33%. NZD most sold currency -.91%. CAD/CHF top spread pair now sitting at +32.79%. Yeah, no changes taking place. We’ll just be patient and watch what happens. Back to work…back to school. GBP took the most bid that session +1.38%. CHF took the most hit that session -1.12%. CAD/CHF (top spread pair) climbed from last session at +33.45%. Just about where they started the day at. The Dollar (white) came up by +1.31%. Rubbing elbows with the Pound (blue). So…basically they both came back on from where they started the open at. Sort of. And again, let’s look at our extreme currencies. Even though the CAD went more sold, today so far, the CHF also went selling. But moreso. So, at least we didn’t see a complete polarized turn there. Bottom line…no real changes happening. Once again, I will mention about the NZD. Will they come back above water, before the end of the day? As recent history has shown, they like to come back up. We’ll see if this plays out in the same way. Btw…Mr. Oil is making a charge upwards (54). I kind of think that’s why Mr. CAD is being supported up there. And that’s a little intermarket analysis for ya. I’ll throw that in for no charge. Ok. Be careful out there. GBP (blue) took that session +.76%. JPY (purple) lost that session -.73%. A bit of positive flow +2.0%. GBP took the day in total +1.56%. CAD (brown) lost the day in total -1.61%. Well, what do we got? No line up changes. 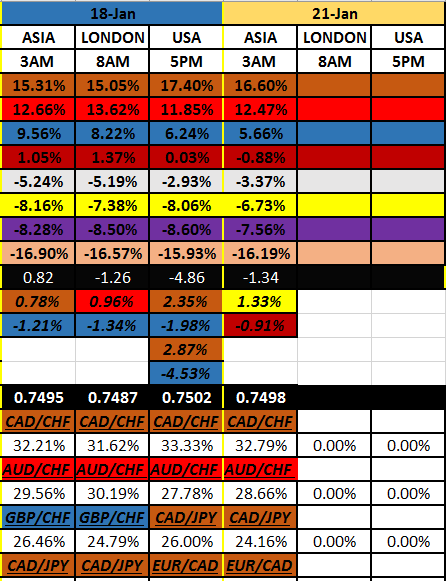 I did notice the NZD (dark red) ended up in the negative territory. But, I won’t assume anything, since they didn’t drop all that much below. Interesting though. They did make some pips up though. Came up +.47% that session. But, all in all, for the day, dropped -.87%. First off, all these numbers are quite low. Probably because it’s a Monday. If you would have seen my other charts (sorry I didn’t take any pics), you wouldn’t have seen any one higher than 40 some percent today. Which was the GBP. That is a light day. Now, when we get rolling in the week, oh, we’ll see upwards of 90 some percent. That is a normal, someone strong, middle of the week, day. Unless I see a change, I don’t change. Let’s see 'em. For a Tuesday beginning. JPY (purple) the most bid currency for that session +2.69%. AUD (red) the most sold currency for session -2.30%. In fact, every single currency went their opposite flow. So yeah, this is definitely risk-off happening. Especially when I see both the AUD and the JPY. Very typical. Well, we also get to see by how much. I just took a pic right now to show you something. % Chg is what you want to look at. We can easily see that the JPY is the most bid currency. Because they are all in the negative %, right? Also we can see that the most one being sold is the AUD -.59% (I have all that in order). But also, we can see that the CHF is the next most bid currency, which would be the smallest negative % there. Then the USD next up. 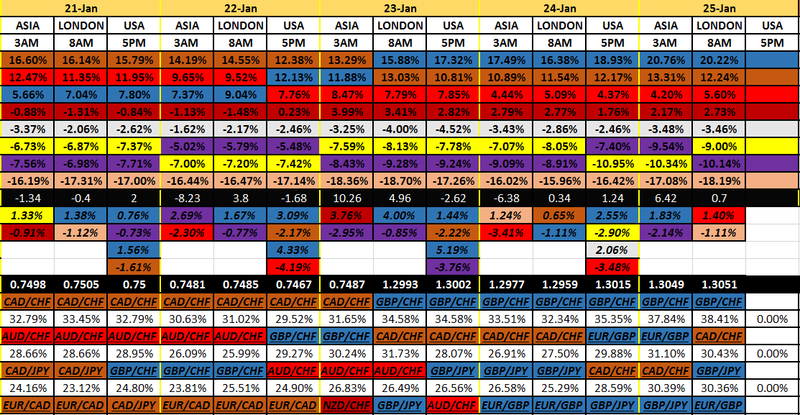 Well, this shows us that it’s risk-off and safe haven currencies have the most bid overall. Now in regards to how much. See, what I was telling you yesterday, no one reached higher than around .44%. And that was during the entire day in total. Today we’re seeing as high as .59%. For the first session…that’s quite high. If everybody will take this cue today, it could climb up to around 1.00%. Basically there is much sentiment happening right now. But, one session down, 2 to go. We’ll have to hold on and see where they end up. What can I say…it’s the game. See ya in the daylight. Hello…and welcome to the new year. Let’s see how this Tuesday is rolling out. GBP (blue) took the session +1.67%. JPY (purple) most sold currency that session -.77%. Positive aggregate flow this time at +3.8%. 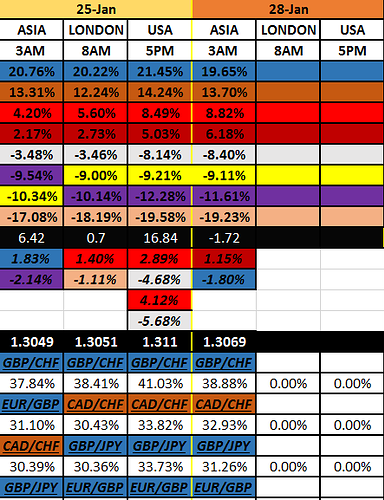 Top spread pair still CAD/CHF sitting at +31.02%. Well, the market, as a whole, took some risk back. Thanks London. And, speaking of that, let’s look at the Pound. If you look back (on my excel sheet) they hit a high of +10.77%. But then to drop all the way down to +5.66%. Only then to climb back up…so far. Sure, we have to see how they end up today. But possibly that could be the bottom. Needless to say, today’s ending figure will be telling. In regards to them. Looks like I will forever be telling you that we need end of day numbers. But, on the other hand, checking the stats only 3 times a day is so much better than looking at the hourly charts. Know what I mean? Looking at the Comms, and how they are relating to each other, this past session…The CAD was the only one of those 3 to catch a little boost. I don’t know, it’s something to note. 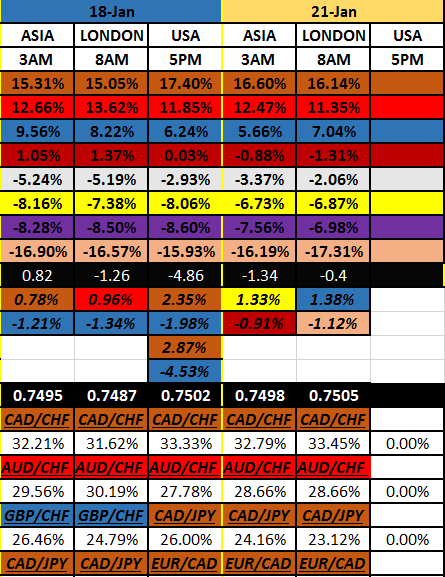 And also interesting to me is that the 2 polar currencies (CAD,brown, & CHF, pink) are sort of equal in how much they are out there. The rest of them are working it out in the middle. I don’t know…maybe the GBP is trying to break on out and get into the teens. shrug We’ll see, right? We can only watch and suppose. Cause they did break away from the 0 line. And welcome to the year 2019! Let’s see how Tuesday ended. GBP (blue) took that session also, +3.09%. 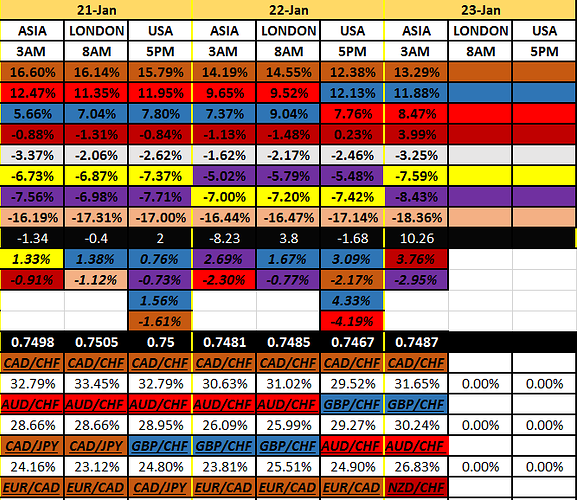 CAD (brown) lost that session, -2.17%. GBP took the day in total +4.33%. AUD (red) lost the day -4.19%. A bit of negative flow -1.68%. Well, well, well. Looks like we have a contender. Hello GBP. It’s end of day and they really got up there. Sitting now at +12.13%. And made a line up change. 2nd now. The JPY made a line up move up also. But surely that’s because of the risk-off sentiment today. 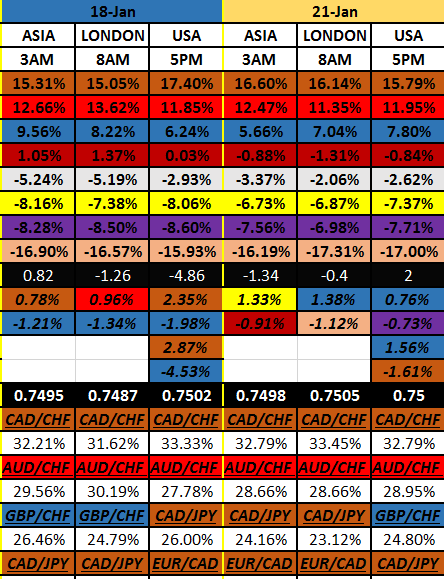 The CHF is still scraping up the bottom of the barrel. The NZD ended up above water. That’s interesting to me. What a come back this afternoon. Especially due to the fact that both the AUD, CAD, lost their butts. Man…is risk on wanting to come back? shrug I mean, you know, the GBP is more noted for risk on than risk off, that’s for sure. Btw…I’m still in with the CAD/CHF. They are above the GBP/CHF. 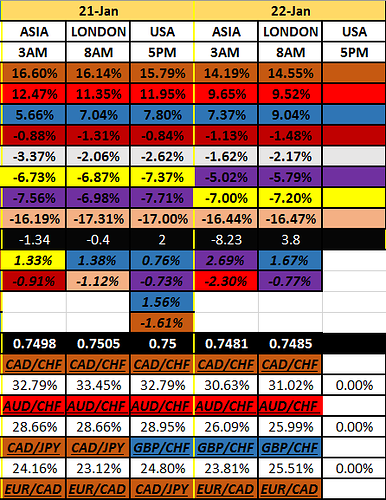 But, as long as the CHF stays weak, should be fine. Alright. Have a good night. Here’s how mid week is unfolding. NZD (dark red) took the session +3.76%. JPY (purple) lost the session -2.95%. Very much positive flow +10.26%. 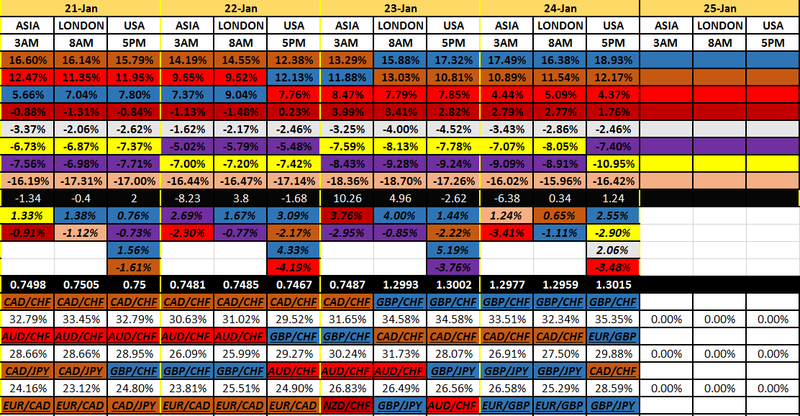 CAD/CHF still top spread trade at +31.65% month running. It’s back to risk-on. And boy, the NZD made a statement. That’s quite a bit. So, looks like their back in the game. Well, it’s interesting that the GBP (blue) is the only currency that did not travel in their flow. Whoever was in the positive, went more positive, and likewise with negatives. The JPY knocked back down below the EUR, in the line up. Maybe yesterday’s actions were a little blown up. Cause, look, the JPY dropped very much also this session. Almost 3% in quite much. And how about the positive flow. 10.26%…is very much high. We’ll have to see if that gets corrected some, or will risk-on want it all more. We’ll have to see. Sorry 'bout that last post. I did it, but somehow didn’t send it. So, was sent just before 8am. Oh well. GBP (blue) took the session +4.00%. JPY (purple) lost the session -.85%. Wow. Ok. Looks like the GBP grew some legs. All the way to the top. Now we just have to see if they stay there at days end. And see, it’s all right there before your eyes. It’s no surprise. That’s why we keep track, right? All the progress is in plain sight. Not too small of a perspective, nor too large. As you see, we do have a new top spread pair, GBP/CHF. But, I don’t want to put that down as a summary…just yet. Definitely will, if it will make it to the end of day. All we have here is a heads up. And the way it looks, by the way it tracked, sure does look like a keeper. We’ll see. You have to admit though, the CHF is quite the sold currency. They are in the top 3 ‘top spread pairs’. It should be of no surprise. No real change going on with them, so far. They are trending down. Until we see a change, that’s their direction. Looks like I might have a decision to make, at days end. Which will be another extreme demand trade, for me. But…I will consider it in the context of the entire week. Timing is a crucial aspect. You know how currency pairs like to behave. They like to stretch out…retrace back to the resistance level…and then turn it into a support level. Therefore, it’s not always smart to just jump in right away. I can’t tell you how many times I have, in the past, gotten in at the very top, then it retreats for a time. So…patience is key. And, I think, putting it into the context of a weeks time. I’ll tell you how I navigate it. Alright. Make it a good day today. GBP (blue) took the session again +1.44%. CAD (brown) lost the session -2.22%. GBP took the day with +5.19%. JPY (purple) lost the day with -3.76%. Well, that leaves us with no doubt about the Pound. And what happened to the CAD? They haven’t seen +10% since the very first week of this month. That’s telling, for me. I think money lost it’s appetite with them. And we know where money wants to go now. So therefore, I pulled the trigger. I got in the last half hour before the close. Oh, by the way, my stop loss got triggered with the CAD/CHF earlier today. Oh well, it was a good run. Made some money. What we have is a change taking place. I wanted to tell you my reasons for getting in with that top pair. They are the top spread pair. The CAD dropped off dramatically. No one else is close to the GBP now. Just check the %'s. The CHF so far away from anyone at the bottom. On the daily time frame looks like they have another 150 pips to the major resistance level. So, have room to run. Can’t see any other contender, or even a possibility, for a top trade. Unless the GBP shoots themselves in the foot and drops out. Those are my reasons. That is all according to my plan. For that particular trade of mine. I can’t soley rely on just one method. Anyway, I got in at 1.3004. The spread bumped it up a little, you know. All I hope for is the trend to continue. And if anything goes haywire, well, that’s what the stop loss is for, right? Let’s look at the beginning of Thursday. CHF (pink) took that session +1.24%. AUD (red) lost that session -3.41%. Well, hello CHF. I guess someone heard me talking about them lately, just to come on by and prove the opposite. It’s ok. I’m not seeing any real change. They had a good session. Right around 1% is not all that much. Now, the AUD might have something to worry about. Ouch. That has got to hurt. Oh, yeah, I remember why now. They had their unemployment data come out right around the start of their session. Must have been bad. So, we’re seeing some hits being taking. But no line up changes. Let’s see how it all unfolds. Ok. See ya in a fews hours. How about a little more Thursday. CAD & AUD both were tied for the top most bid for that session at +.65%. GBP most sold currency that session -1.11%. Aggregately, a bit of positive flow. .34%. Meaning, the shake out of the positives going more positive and the negatives going more negative, it ended up more that way than the opposite. So, what do we got? No line up changes. The USD has been more of a bid today. Let’s see…for the day so far…they are sitting at +1.66%. Yep, that’s a good bit (being at the mid point of the day). And for the GBP…they lost -.94%. That’s all from the open, starting point. 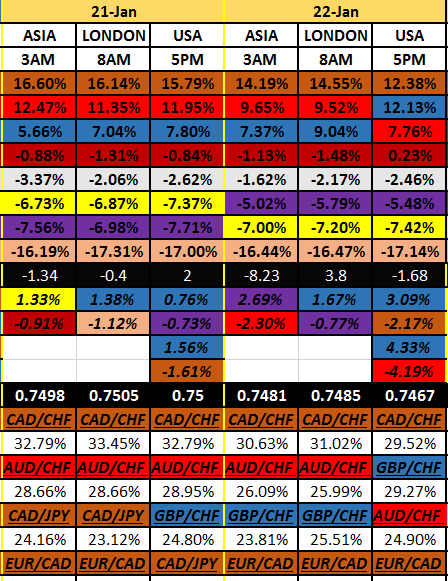 And, what about the CHF…they increased +1.30% since the open. That is impressive. Oh, how about the AUD? They lost -2.76% since the open. Now that’s taking a hit. Well, that’s some perspective for ya (there’s so many perspectives). 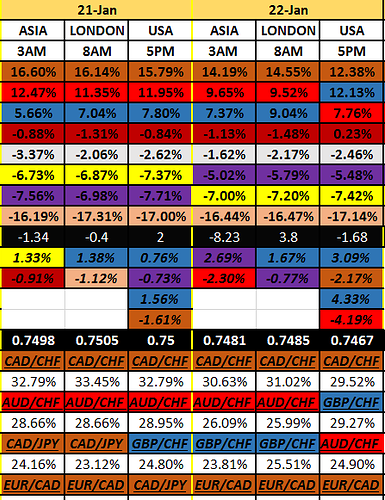 The top spread pair (GBP/CHF) came a long way to get to the top. Just look at where they started the week. Actually, they were sitting at +6.24%, Friday’s close. This pair needs a breather. Things don’t go straight up. Profit taking takes place. We’ll have to see if there’s any more buying before the end of the week. So, you have to give it some time to see if this will be a keeper. There’s nothing wrong with a little retracement. I’m kind of glad it’s happening now, instead of tomorrow. All that is my rationalization of the situation. But, given all things considered, I rest upon my strategy. I will trust that more than anything. In the long run, I believe being in with the top spread pair will pay off. Plus, trading has so much to do with just being in with the right pair. Let’s see…stop loss placements, position sizing, taking profit places, timing, the waiting period, patience, the whole as opposed to a particular point in time. Let’s just see what happens the rest of the week. See ya at end of day. GBP (blue) took that session +2.55%. EUR (yellow) lost that session -2.90%. USD (white) took the day in total +2.06%. AUD (red) lost the day in total -3.48%. GBP/CHF top spread pair at +35.35%. What a surprise…about the GBP comeback. I mean, they go from losing the prior session, to taking the very next one. Basically, their morning time was such a sell, then after lunch, was such a bid. But then, the Americans took over to finish them up. And I guess it was Draghi and team that did it for the EUR. Well, in the line up, they dropped below the JPY. And looks like they finally came close to their brother, the CHF. That is what is normal. Historically speaking anyway. GBP (blue) took the first session +1.83%. 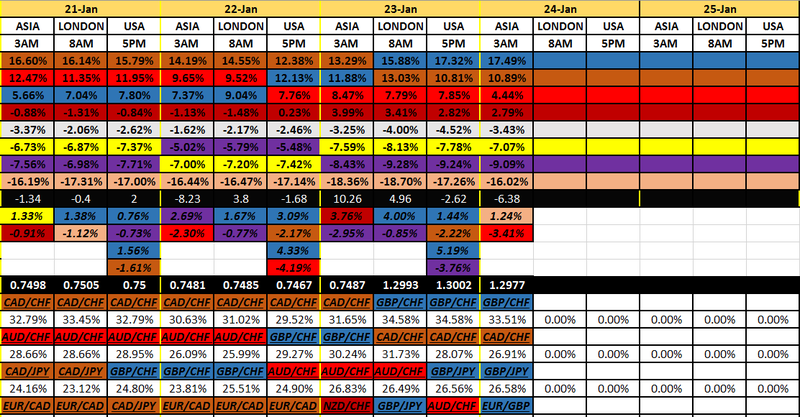 JPY (purple) lost the first session -2.14%. Some good positive flow 6.42%. GBP/CHF top spread pair climbing, at +37.84%. Ok. Things are going according to their flows. And that’s what we want. No real changes happening. They are all relating to one another pretty consistently. I’m so glad the GBP got this boost going into the end of the week. I think it’s a good sign. That was a good retracement yesterday, and I’m glad that it was short lived. Hopefully we’ll end out the day strong. You know…take some profits…and get back in. Let’s see the week, with one more session to go. AUD (red) took that session with +1.40%. 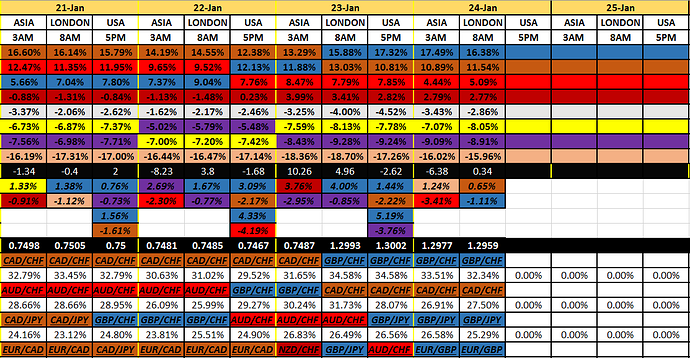 CHF (pink) lost that session with -1.11%. About break even with the aggregate flow .7%. GBP/CHF, top spread pair, climbed more, sitting with a difference between the two currencies at +38.41%. Also at 8am being at 1.3051. Well, I see the AUD has been clawing their way back from a real hit yesterday. Basically, I’m seeing that the money wants to go with them. They are not down and out of it. They just had a set back yesterday, that’s all. The NZD (dard red), also, is not all that laying down either. Staying above water (0%). Not dropping below that. Well, speaking of those above water. That would be the GBP (blue) along with the Comms (reddish). Basically, the pound found their way leading the pack. Also to be noted that the CAD (brown) had bumped themselves back above the 10% area. Take a look. 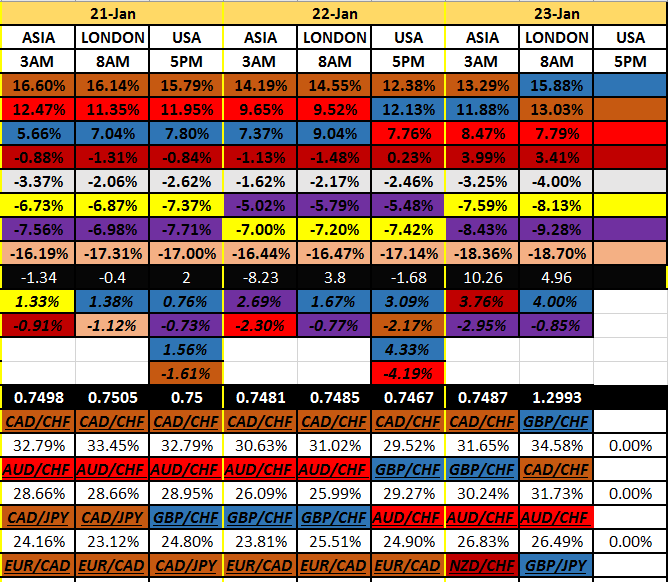 So…as the whole entire month as been unraveling…the only real difference (at the top) has been the GBP story. And, as of now, no real changing taking place. What about down below? 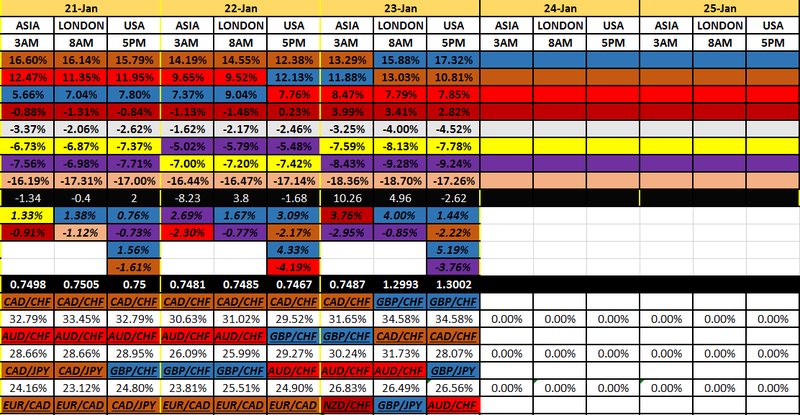 Take a look at the CHF (pink). I think their pretty content dragging the bottom. And we can see between the EUR (yellow), and the JPY (purple), they have been changing back and forth. Pretty much second to last. So, they both have been a sell for the most part. The USD (white)…well, been pretty consistent, just below the 0 mark. Again, no real changes happening. So, the way I will be looking at this. We’re heading into the last day of the week. Hopefully the trend will continue this way. You know. But then, next week will finish out the month. You have to have a sense of that. We will be heading for Thursday. That’s the last day of the month. And I will be wondering whether any kind of changes will want to produce. Like…where does the money want to go to? And where does the money want to leave? Will the GBP continue? Will the Comms continue, above water? Will the CHF continue happily down below? Will risk-off scenario stay away (JPY)? Will the EUR (yellow) ever want to get above the USD (white)? Those are some of the questions I keep in mind (actually I have all that written down). Alright. Let’s get on with the day. And make the best of it! See ya at the finish line. AUD (red) took the session +2.89%. USD (white) lost the session -4.68%. AUD took the day in total +4.12% today. USD most sold currency total -5.68%. 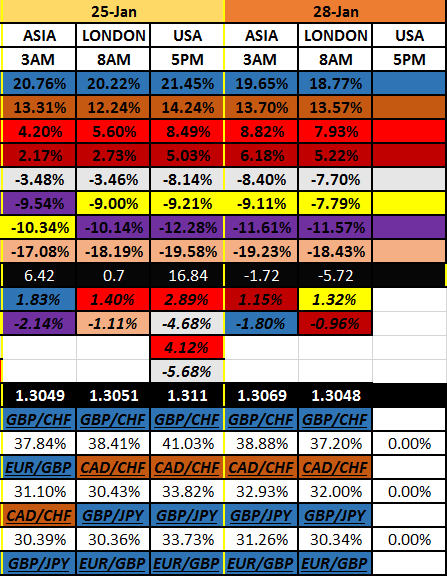 GBP/CHF, top spread pair, have the biggest difference between them (out of all of the pairs), sitting at 41.03%. Also, they ended the week at 1.3110. Let’s talk about the flow for a minute. We’re talking right along party lines. Every currency in the positives went up, quite a bit. And likewise, every currency in the negatives went sold, quite a bit. That’s called a trending market (for that session). And being a Friday, that told me a lot. I’m not seeing any kind of changes. Look. I’m not new to this. I do realize that hindsight is 20/20. Actually, I have always called hindsight evil. In my mind, that’s how I see it. Everybody and their mother can look back and be the expert and tell you what you should have done and shouldn’t have done. I understand that. I mean, who would’ve guessed that the GBP would be this high up there? Man…I was pretty nervous getting in with them, when they got there. But, it’s my strategy. So I do. And it just happens to work. Navigate that top spread pair, and in the end, it’ll work out. I mean, how many times in the past has the Pound shot up like this, only to fall flat on their faces. Believe me, I could show you. Therefore, I think it’s best to know when to take profits, get back in, and do the same thing. If the trend changes, take the losses, then go with whoever is that top spread pair. I don’t know. That’s how I do it. But, you have to think about it, that’s the definition of a trend. Things will continue, until it changes. What else can you do, right? I banked a lot of profits. And that’s my horse until something changes. We’ll have to see how next week rolls out. It’s the weekend. Enjoy life…family…a book. 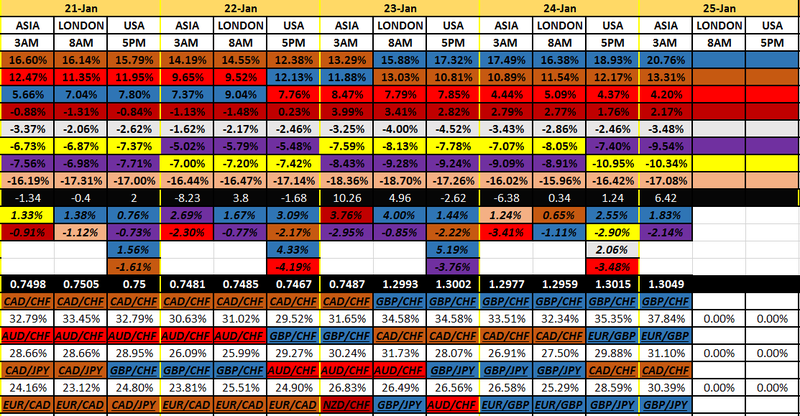 NZD (dark red) up the most this session +1.15%. GBP (blue) down the most this session -1.80%. Some negative flow came about -1.72%. Ok. Well, our polars turned inward, as most others also did (hence the negative flow). It is interesting how the NZD came out on top. They seemed to buck that opposite trend sentiment, that session. Well, the one thing I will definitely be tuned in for will be the end of the month play. So far, no changes happening, but I will be looking out for it. It’s kind of like a caution thing. Cause it happens, as history proves. Don’t worry, I will give you heads up about it. I want to know, and need to know…cause I have plans for that (a change). But, as it stands, nothing now. Ok. It’s Monday. Let’s get back into it, shall we? EUR (yellow) most bid currency that session +1.32%. 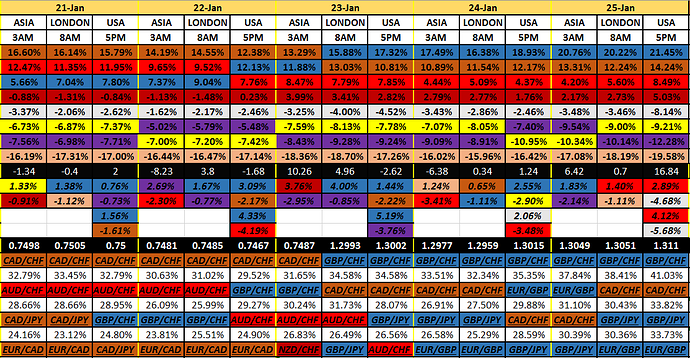 NZD (dark red) most sold currency that session -.96%. Quite a bid of negative flow -5.72%. Ok. Speaking of negative flow, yep, we had it. Look at all of the top positive standing currencies. They all dropped that session. Also all of the negative standing currencies came up. Well, that’s very nice to see. Know why? Cause no one currency is standing out. Meaning you can’t really pick out a specific changing currency. It’s kind of like profit taking taking place. But, there surely isn’t a sore thumb sticking out and out of place. See, you have to see them as they relate to each other, if you care about the market as a whole (which I do). Also, let’s don’t forget that those (2) polar currencies are way out there. We’re talking about 18% out. Those in between aren’t all that close. So, we need to expect this stuff. Profit taking. No changing of the line up yet. But, I do am a little excited to see the EUR (yello) inch up closer to the USD (white). I’ll let you in on a little secret. Depending on how the day ends, and by how much…If that happens (yellow goes above the white) I just might take that trade. EUR/USD long. That’ll be chalked up under my change trade. Look. I’m sure there’s other factors, because I haven’t looked at their chart yet. Cause, you know, timing is very important. But, in any case, if that happens, that specific pair will be on my radar. Be good to each other. And let’s make it a good day regardless of what happens today!